Born in Manchester in 1857, Lomax studied at the Munich Academy in Stuttgart before returning to Manchester and finally to London. His paintings are mainly historical genre subjects with particular interest in the Civil War period, often with dramatic and sentimental quality. He is much noted for his ability to render in great detail individual expression and differences in quality of textures. This is a small and exquisite painting that keeps the viewer entranced with its clever composition, drama and detail. A fine example that great paintings come in all sizes. Lomax exhibited at The Royal Society of British Artists, Birmingham, Walker Art Gallery, Liverpool, Manchester City Art Gallery, The Royal Academy and the Royal Institute of Oil Painters. Posted on July 8, 2016 by Nigel Rhodes and filed under Country: British, Oil on Canvas, Type: Genre, Period: twentieth century, 19th century, Type: Painting and tagged Genre debate nineteeth century conversation Collecting Fine Art interior design fine art dealer nigel rhodes fine art. Japanese Imari Charger Circa 1900. Imari porcelain is the name for Japanese porcelain wares made in the town of Arita, in the former Hizen Province, northwestern Kyūshū. They were exported to Europe extensively from the port of Imari, Saga, between the second half of the 17th century and the first half of the 18th century. Imari or Arita porcelain has been continuously produced up through the present day. Typically the colours used are cobalt blue with red and gold. While subject matter is varied with foliage and flowers, people, genre scenes and pattern. Most designs are uniquely Japanese owing to the rich Japanese tradition of paintings and costume design. The porcelain has a gritty texture on the bases, where it is not covered by glaze. There is also blue and white Imari. Posted on June 11, 2016 by Nigel Rhodes and filed under decorative, Decorative, japanese, Period: twentieth century, Type: Decorative, Type: decorative, Type: Porcelain and tagged imari porcelain charger plate japanese. Born in London, and younger brother of William Ward the engraver, James Ward was influenced by many people, but his career is conventionally divided into two periods: until 1803, his single greatest influence was his brother in law George Morland; from that time, it was Rubens. From 1810 or so, Ward started to paint horses within landscapes; slightly later, he turned to very large-scale landscapes, of which Gordale Scar (Tate, London), completed in 1814 or 1815 and depicting Gordale Scar (Yorkshire) as an example of thesublime, is considered his masterpiece and a masterpiece of English Romantic painting. James Ward was one of the outstanding artists of the day, his singular style and great skill set him above most of his contemporaries, markedly influencing the growth of British art. Regarded as one of the great animal painters of his time, James produced history paintings, portraits, landscapes and genre. He started off as an engraver, trained by William, who later engraved much of his work. The partnership of William and James Ward produced the best that English art had to offer, their great technical skill and artistry having led to images that reflect the grace and charm of the era. He was admitted for membership into the Royal Academy in 1811. One of Ward's best-known paintings,The deer stealer, was commissioned in 1823 for the sum of 500 guineas by Ward's patron Theophilus Levett. When the work was finished, Levett pronounced himself delighted with the results, and consequently raised the remuneration to 600 guineas. Subsequently Ward was said to have been offered 1,000 guineas for the painting by 'a nobleman,' which he declined. The painting now hangs at Tate in London. Posted on June 8, 2016 by Nigel Rhodes and filed under 19th century, Country: British, Type Animal, Type: Genre, Type: Painting and tagged dogs fighting nigel rhodes fine art fine art dealer collecting Fine Art. Inscribed upper right with date and sitter’s age ‘Ano Domini. 1597/ Aetatis Suae.64.’ and upper left with family coat of arms. 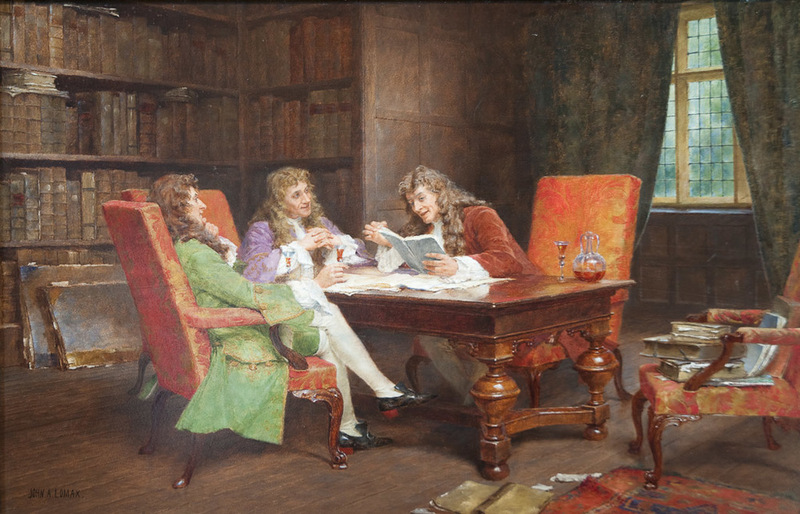 Our painting has been attributed to an anonymous artist identified as the Unknown Follower of Custodis (fl. 1590-1612). It is characteristic of the artist’s style with an iconic, two dimensional format and limited palate. Hieronimo Custodis himself was a protestant émigré from Antwerp who had fled to England after the capture of the city by the Duke of Parma in 1585. His dated works are from 1589 until his death in 1593, therefore our painter seems likely to have been an assistant of Custodis and perhaps even inherited his pattern book. Identification of our sitter is based on the elaborate family armorial displayed top left on a red marble pillar. Sir John Fortescue is shown three-quarter-length, wearing a black doublet, white ruff, a high-crowned beaver hat and resting his right hand on the knob of a walking cane. Suspended on a gold cord around his waist, he wears a cameo jewel depicting a bust-profile of Elizabeth I. A noted scholar, Fortescue counted Sir Thomas Bodley (1545-1613), the founder of the Bodleian library, and Sir Gabriel Goodman (1529-1601), Dean of Westminster, among his friends. It is likely that the portrait was painted as a gift for Goodman and it is almost certain that Goodman gave the painting to Christ’s Hospital or the Grammar School at Ruthin, both of which institutions he founded. For many years our painting of Sir John Fortescue hung in the Cloisters of St Peter’s Church at Ruthin. The Cloisters also held a portrait of his good friend, Sir Gabriel Goodman, painted in 1600, and these portraits most likely hung together at Ruthin. John Fortescue (d. 1432) of Holbeton in Devon, was an administrator in the service of the Courtenay family. His eldest son, Henry (d.1490) held the post of chief justice of the king's bench of Ireland between 1426 and 1429, whilst his second son, Sir John (c.1397–1479), was revered as a justice and political theorist. Oxford Dictionary of National Biography, accessed 18/05/09. Arnold, J ( 1988) ‘Queen Elizabeth’s Wardrobe Unlock’d’, pp.163-165. Maney and Sons: Leeds. As Keeper, Fortescue was responsible for the care of the Queen’s royal attire, textiles and jewellery as well as armour, furniture, state documents and the occasional detention and interrogation of prisoners. Even after that date, the chancellorship remained a comparatively administrative position, concerned more with the daily administration of the realm rather than parliamentarian policy. However, it grew in importance in line with a shifting balance of power between the crown and parliament and key resolutions passed by the House of Commons in 1706 and 1713 endowed the executive, rather than the monarchy, with the authority to initiate and approve financial legislation. These changes meant that the office of chancellor, formerly administrative, became increasingly political. Since the early nineteenth century, the Chancellor of the Exchequer has been the cabinet minister responsible for finance and the head of HM Treasury. Posted on June 8, 2016 by Nigel Rhodes and filed under Country: British, Date: Seventeenth Century, Date: Sixteenth Century, Oil on Board, Portraiture, subject: Portrait, Type: Painting, Type: portrait and tagged nigel rhodes fine art Collecting Fine Art fine art dealer portrait. Edward Williams Senior (1782-1855), father of the well known Williams family of painters and founder of the Barnes School, was popular and successful as a landscape painter during the Victorian era. The Williams family paintings are characterised by genre scenes typical of the English landscapes of their time. Interestingly the fact that the figures and objects in his landscapes take second place to the skilled rendering of light and shadows parallels the attitude to portrait painters over landscape painters during this time. The Williams family of painters were popular in their own times and are well represented in collections across the country. Posted on June 7, 2016 by Nigel Rhodes and filed under Country: British, Oil on Canvas, Period Eighteenth Century, Period: 18th Century, Type: Painting, 19th century, Type: Landscape and tagged fine art dealer nigel rhodes fine art genre english landscape English Genre painting Victorian. Claude Lorrain, born Gellee, in Vosges in Lorraine - then the Duchy of Lorraine, an independent state until 1766, one of five children, orphaned at twelve, went to live at Freiburg then moved to Rome and then to Naples, where he apprenticed for two years, from 1619 to 1621, under Goffredo (Gottfried) Wals. In 1625, returning to Rome he became apprenticed to Augustin Tassi. He toured widely through Italy, France and Germany and at Nancy he painted architectural subjects on the ceiling of the Carmelite church. In 1627 Lorrain returned to Rome. Two landscapes made for Cardinal Bentivoglio earned him the patronage of Pope Urban VIII. From about 1637 he rapidly achieved fame as a painter of landscapes and seascapes. He apparently befriended his fellow Frenchman Nicolas Poussin; together they would travel the Roman Campagna, sketching landscapes. In order to avoid repetition of subjects, and also to expose the many spurious copies of his works, he made tinted outline drawings (in six paper books prepared for this purpose) of all those pictures sent to different countries; and on the back of each drawing he wrote the name of the purchaser. These volumes he named the Liber Veritatis (Book of Truth). This valuable work, engraved and published, has always been highly esteemed by students of the art of landscape. Landscape as a subject was considered unclassical and secular. Pure landscape, like pure still life painting or genre, was considered lacking in moral seriousness - in comparison to the prized mythic or religious scenes of this time. Posted on June 7, 2016 by Nigel Rhodes and filed under 19th century, gilt, Oil on Canvas, Seascape, Type: Genre, Type: Landscape, Type: Painting and tagged landscape Italian nigel rhodes fine art fine art dealer Old Masters gilt frame sea port seascape. A beautiful tea caddy, in mother of pearl with red velvet interior, a rare find and in excellent condition and a lovely decorative item. With working lock and key. Although wooden Tea Caddies were made early in the 18th century, it is not until the second half of the century that they were introduced in any numbers as a home style accessory. The word caddy derives from the Malay "kati" a measure of weight about 3/5 of a kilo. The 17th century tea containers were bottle shaped tea jars in china, glass, silver, enamel and straw-work covered metal. Tea Caddies were made in wood in box form from the second quarter of the 18th century. The first such boxes were shaped like small chests and contained three metal canisters. They were mostly made of mahogany although a few early ones were of walnut. Very occasionally a chinoiserie box was made. Complete boxes of this type are difficult to find, especially in walnut. Chinoiserie boxes are exceedingly rare. In England in the 1700s, tea was an expensive commodity. To keep it safe, people would store it in a lockable Tea Chest or Tea Box, which eventually became known as a Tea Caddy. As tea was too expensive to risk leaving in the presence of servants, the caddy would be kept in the drawing room. Subsequently, the Tea Caddy became an important & fashionable accessory for the home. Today Tea Caddies are sought after as decorative pieces, in all shapes & forms. Posted on June 7, 2016 by Nigel Rhodes and filed under 19th century, decorative, Decorative, Type: Decorative, Type: decorative, Mother of Pearl, Type: Boxes & Other and tagged tea caddy mother of pearl nigel rhodes fine art antique antiques fine art dealer. Benjamin Williams Leader was born in Worcester, his father was a keen amateur artist - a friend of Constables, and studied art at Worcester School of Design and later at the Royal Academy. The surrounding countryside to where he lived served as his early inspiration, the picturesque villages and churches, the fields and rivers. His work proved very popular and he sold successfully. He was a regular exhibitor at the RA. 1859 proved to be his most successful year yet, exhibiting his 'A Quiet Pool in Glen Falloch', following a trip to Scotland, Leader' s work was bought by Agnew's and was now going to private galleries rather than being exhibited publicly. He painted the landscapes and scenes between the Severn Valley, Worcestershire, and Wales, in particular, exhibited to much acclaim at the RA 1865, was 'Autumn's Last Gleam' and later in 1881 'February Fill Dyke', following which he became an associate (ARA) and then a Royal Academician (RA) in 1898. His works are represented in many museum and private collections. Posted on June 7, 2016 by Nigel Rhodes and filed under 19th century, Country: British, gilt, Oil on Canvas, Period: twentieth century, Type: Landscape, Type: Painting and tagged nineteenth century twentieth century nigel rhodes fine art fine art dealer landscape english landscape English gilt frame victorian oil on canvas oil painting. Arthur H Rigg was a British painter well known for his beautiful landscapes. This work sits within a gilt period frame and would make a lovely statement piece for any room. Posted on June 7, 2016 by Nigel Rhodes and filed under 19th century, Country: British, gilt, Oil on Canvas, Period: twentieth century, Type: Landscape, Type: Painting and tagged landscape Scottish Scotland fine art dealer nigel rhodes fine art nigel rhodes Period: 19th Century 18th century. SOLD to a private collector. Thirdly and finally this painting is notable as it was originally held in the Hyder Collection and the stunning frame with its Gold Crown atop, is similar to those of various paintings at Hampton Court Palace, where this portrait, is thought to have come from prior to being held in the Hyder Collection. Georg Wilhelm LaFontaine or Fountaine, was a Hanovarian Court painter. Posted on June 7, 2016 by Henrietta Clavering and filed under Type: Painting, Type: portrait, Country: British, Date: Seventeenth Century, Period: 18th Century, Period Eighteenth Century, Oil on Canvas, Portraiture, subject: Portrait and tagged portrait king royal fine art english interior design westminster abbey coronation robes collecting fine art fine art dealer nigel rhodes fine art. Arthur A Davis was well known for his dogs, his name is synonymous with Victorian sporting art. As a set of four, these paintings make a beautiful group, signed and dated by the artist. Posted on June 7, 2016 by Nigel Rhodes and filed under 19th century, Country: British, Medium: Watercolour, Period: twentieth century, Type Animal, Type: Painting, Type: Shooting, Type: Sporting and tagged gun dogs dogs pheasant sporting nigel rhodes fine art fine art dealer. in miniatures. The sitter was the eldest daughter of Philip 4th Baron Wharton (1613–1696) and his second wife Jane Goodwin. Her father was a staunch Parliamentarian and close friend of Oliver Cromwell. He had a great taste for architecture and gardening and spent a handsome sum on his home at Woburn. He had a considerable collection of works by Van Dyck of whom he was an important patron. She married three times: her first husband was Major Dunch (1651–1679) by whom she had one son and two daughters. Following his death she married Sir Thomas Sulyarde, 2nd Baronet of Delaware and Chiddingstone, Kent (1648 –1692) and subsequently William, 12th Lord Ross of Halkhead (1656 –1738). Posted on June 7, 2016 by Sue Bampton and filed under Country: British, Date: Seventeenth Century, female portrait, Oil on Canvas, Type: portrait, Type: Painting, subject: Portrait, Portraiture and tagged Female Female portrait Female artist silk oil on canvas fine art coll collecting fine art private collection collecting Fine Art fine art dealer nigel rhodes fine art. George F Papperitz was a well known German artist whose skill and technique is exemplified in this beautiful and sensitive work. Posted on June 7, 2016 by Nigel Rhodes and filed under 19th century, female portrait, Oil on Canvas, Period: twentieth century, Portraiture, subject: Portrait, Type: Painting, Type: portrait and tagged fine art dealer nigel rhodes fine art portrait lady woman female Female portrait. Posted on June 7, 2016 by Nigel Rhodes and filed under 19th century, decorative, Decorative, japanese, Type: Decorative, Type: decorative, Type: Porcelain and tagged jardiniere japanese porcelain imari. SOLD to Chatsworth House Collections. A lovely little painting, with fine detail and colour in a simple classic gilt frame. Posted on June 7, 2016 by Nigel Rhodes and filed under Country: British, gilt, Oil on Canvas, Period Eighteenth Century, Period: 18th Century, Type: Landscape, Type: Painting and tagged nigel rhodes fine art fine art dealer Chatsworth House Country Houses english landscape English Genre painting. Like several of his fellow Newlyners, William Banks Fortescue hailed from Birmingham. Although he is very much recognised as a Newlyn School painter, he spent the majority of his painting career living and working in the rival art colony some seven miles away at St Ives. Posted on June 7, 2016 by Nigel Rhodes and filed under Country: British, Oil on Canvas, Period: twentieth century, Type: Painting, Type: Genre and tagged Newlyn girl oil on canvas twentieth century nigel rhodes fine art fine art dealer. Alberto Morrocco was born in Aberdeen, the son of immigrant Italians. He is famous for his Scottish landscapes and his precocious talent as a draughtsman. Heavily influenced by Picasso and Braques, prodigiously productive, Morocco spent the majority of his career as Head of Painting at Duncan of Jordanstone College of Art, Dundee. Without doubt the greatest portraitist of his generation, well known for his portrait of The Queen Mother as Chancellor of The University of Dundee. Awarded the San Vita Romano Prize and the Guthrie and Carnegie Awards of the Royal Scottish Academy, he served on sth Scottish Arts Council and the Royal Fine Art Commission for Scotland, he was awarded an OBE in 1993 and elected an Honorary Fellow of the Society in 1995. His works are sought after and well collected, well represented in museums and private collections and his work is known particularly for its other worldliness and skill of execution. Posted on June 7, 2016 by Nigel Rhodes and filed under Country: British, Oil on Canvas, Period: twentieth century, Type: Landscape, Type: Painting and tagged oil on canvas twentieth century Subject: Landscape nigel rhodes fine art fine art dealer. A beautiful example of Flemish painting from the eighteenth century, with typical fine detail and rich colour. Verdussen was possibly a member of the famous family of printers from Antwerp but this is not certain. This painting showing such skill in the techinques of oil painting, is obviously by the hand of a well known and expert artist. Posted on June 7, 2016 by Nigel Rhodes and filed under Country: The Netherlands, gilt, Oil on Canvas, Period Eighteenth Century, Type Animal, Type: Equestrian, Type: Painting, Type: Sporting and tagged antwerp The Netherlands equestrian oil on canvas painting nigel rhodes fine art fine art dealer.